I reworked Poltava's great Korean F-84G bomber campaign to be compatible with the latest BAT 3.5 Musketeer version! All credit goes to him! This download comes complete and ready to play. You do not need any previous version of the campaign. I reworked minor ground stuff for compatibility and tweaked the take-off patterns so is not so prone to crash. 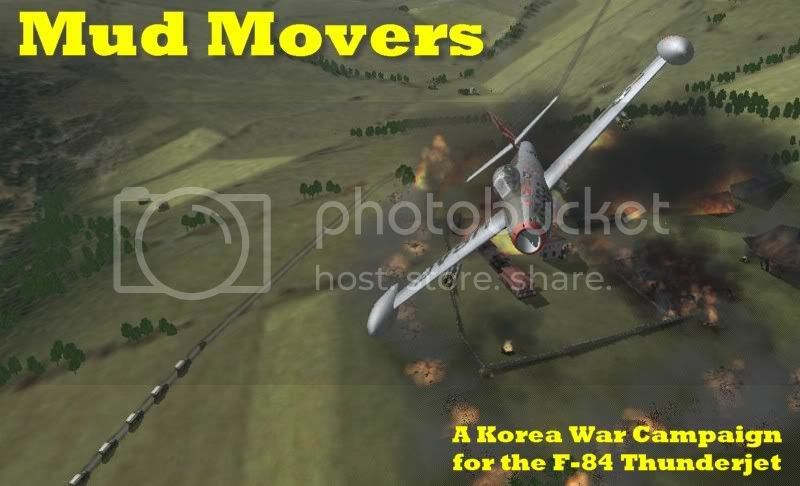 this version of the campaign is called "Mud Movers 1952 (BAT JTW)" in the game! Thanks a lot for sharing and thanks to Poltava as well! Thanks a lot! This is one of my favorite campaign. Thanks a bunch for this and all of your other hard work!! Thanks Vampire Pilot..love moving mud !!!! Hm, my F-84 explodes when I load in. Not sure what I'm doing wrong. Because my game didn't crash would logs be of any help? Mission 01 has a bug, I will fix it and upload a new version. ohooo!!! !, thank you for your time and work. But I'm very pleased to see my old campaign has been updated to BAT standards and can be used again! Pound the ground, gents!